Sometimes inner peace happens outside. ​Unaware of each others’ faltering lives, three women are brought back together when their fourth childhood friend, Onya, restarts her mother’s restorative retreat in their hometown and reaches out for their help. During their week at home, the four friends find it hard to keep recent secrets in their lives from each other and are forced to honestly view the power of their life choices. 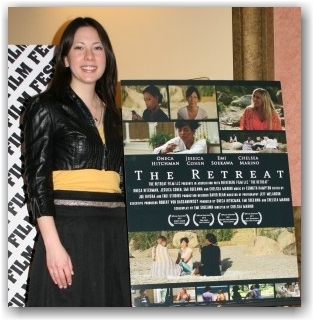 The Retreat was an official selection of the 2010 NYC Downtown Shorts Film Festival, the 2010 Big Apple Film Festival, the 2011 Staten Island Film Festival, the 2011 Hoboken International Film Festival, New Filmmakers NY Summer Fest 2011, and the Boston International Film Festival 2011, where it received the BIFF Indie Soul Special Recognition Award. The Vienna General Hospital; 1849. One in three newmothers die from Childbed Fever within days of giving birth. Hospital Director Klein deems it, "The price God has put on the great gift of bearing a child." But Dr. Ignaz Semmelweis, First Assistant of the ward, cannot believe it is so. Haunted by the screams of dying mothers, and fraught with nightmares, Semmelweis embarks on a forbidden quest to discover the cause and cure of the fever. What he finds, however, is a new way of thinking. Alfred P. Sloan Foundation Script Award winner; New York First Run Film Festival 2002 (Awards in Cinematography, Sound, Editing and Carl Lerner Award for Best Film with Social Significance); Houston WorldFest 2002 (Bronze Remi Award); Official Selection of the 2001 EuroShorts Warsaw and 2002 Telluride IndieFest (Winner, Short Film Category), L.A. Shorts, Palm Springs, Atlanta, Ojai (Best Short Honorable Mention), Tahoe International, New Jersey State and Newport Film Festivals; the 2003 Sarasota, Fayetteville (Grand Jury Prize for Best Short Film) and Durango Film Festivals; the 12th Prix Leonardo, Parma, Italy (Certificate of Merit in Silver), St. Petersburg, Russia (Best Short Film), Festival of Nations, Ebensee, Austria (Bronze Award). Animation Prize and Festival Prize, 2004 2nd Annual UCCS Student Short Film Festival; Official Selection of the 2003 New York City Horror Film Festival; 2004 New Hampshire Film Expo; 20,000 Leagues Under The Industry Festival; Conestoga Short Film Festival (First Place, Horror Category); 2005 Ozark Foothills Film Fest.